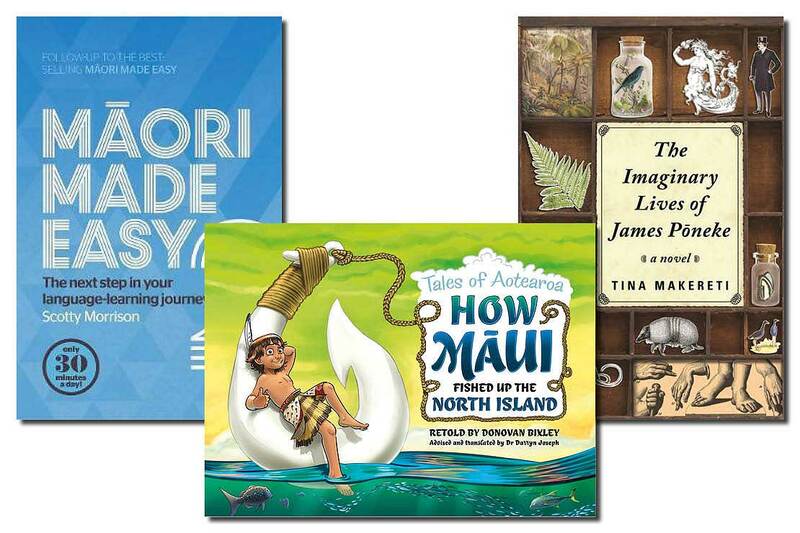 Three Massey University authors have books out in time for Te Wiki o Te Reo Māori, Māori Language Week this week. Te Pūtahi-a-Toi’s Professor Scotty Morrison, Te Arawa, will launch a follow-up to his popular Māori language learners guide, with Māori Made Easy 2. It takes learners through 30 weeks of 30-minute-a-day learning, and online podcasts to support the lessons. Penguin first approached Professor Morrison in 2011 and when the The Raupō Phrasebook of Modern Māori outsold expectations on a new wave of desire for Te reo Māori learning, Māori Made Easy followed. Last year Māori at Home, co-authored with his wife and Te Pūtahi-a-toi lecturer Stacey Morrison was published. The new book will be launched at TVNZ this week where the Morrisons, along with Professor Meihana Durie, are providing te reo Māori lessons to staff. Also launching a book this week is School of English and Media Studies lecturer and well-known author Dr Tina Makereti, Ngāti Tūwharetoa, Te Āti Awa, Ngāti Rangatahi, Moriori, Pākehā. Dr Makereti’s second novel, The Imaginary Lives of James Pōneke, is based on a real person who was known to be so clever and eloquent that he defied all suggestions that he was a savage, words that were used quite literally to describe Māori in the 1840s. James finds himself in Victorian London, where it was common to exhibit Indigenous people alongside artefacts, and “freaks” for the amusement of British people. Tomorrow’s launch at the Wellington Museum is part of a busy time for Dr Makereti. Having appeared at the Christchurch Word Festival earlier this month, she's off to Toronto next month for the International Festival of Authors and then on to the Oceania exhibition at the Royal Academy in London in November, where she'll be presenting alongside other authors. Dr Darryn Joseph of Te Pūtahi-a-Toi has also been busy helping give Maui a teo reo Māori voice in a new children’s book. How Māui Fished Up the North Island, illustrated by Donovan Bixley, was created with Dr Joseph’s guidance and he also translated the te reo Māori edition along with Keri Opai.